Although Toronto cannot boast of a large number of architectural monuments or historically significant places, nevertheless it is an interesting city to visit. There are a large number of temples of various denominations, amusement parks, excellent museums, as well as neighborhoods with ethnic flavor, each of which in itself is a reason for getting to know it more closely. 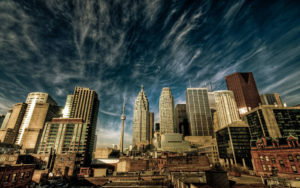 At the same time, despite the eclectic style and the absence of a large number of bright architectural solutions, in general, Toronto is a holistic city that stands out noticeably among other North American cities and attracts millions of tourists every year. It is the most famous and most popular attraction in the city, which is visited annually by about 2 million people. Since October 1976 (date of construction of the tower) until recently, it was the tallest building in the world (553 meters). At an altitude of 340 meters, there is a rotating circular restaurant and an observation deck with a glass floor, which offers a panorama of the city overlooking Lake Ontario. Upstairs you can take the high-speed elevator. The tower is open for visits daily. It was built in 1914 by the successful financier Henry Pellatt, who made a fortune on the construction of hydroelectric power plants and chose a project in the style of a neo-romantic castle for his house. Casa Loma has become the largest residential building ever built in Canada. In addition to the impressive building and magnificent finishes of many of its rooms, Casa Loma also boasts a large garden. In the castle there is a restaurant, it is a popular venue for weddings and other special events, often shooting films in it. It is a museum of nature and world culture. It is the largest museum in Toronto and the fifth largest in North America. The museum has about 40 galleries, which contain more than 6 million exhibits. Especially distinguished are collections devoted to dinosaurs, the art of the Middle East, Africa, East Asia, Ancient Egypt and Ancient Greece, European and Canadian history. The museum constantly has several traveling thematic exhibitions of the largest museums in the world. This is a former city hall building with a characteristic clock tower, built in 1899. At the time of its construction, it was the biggest building in Toronto. In 1965, after the construction of a new city hall, the Old City Hall was to demolish and build several skyscrapers in its place. However, under public pressure, this decision was reversed. In 1989, the old city hall was declared a historical monument, protected by the state. This is a chain of small islands that stretch along the shore of Lake Ontario, on which is located in a recreation area, popular with Toronto residents. The islands are connected to the city by ferry. Total islands occupy an area of ​​230 hectares. There are often various events and concerts, this is a favorite place for water competitions and just a beach pastime. The airport is located on the central island. From the islands a view of the city panorama opens, it is from here that photographs are taken for postcards.